After a lot of paint fumes and rising tides the video to our single "Temper" is out on Youtube. Thanks to the beach crew for taking part and to Jiovan who provided cinematography and direction. See you soon at Commercial Drive Car Free Day! Sinking Ship Western Canada Tour Dates Confirmed! With their debut EP released just five months ago, the Vancouver based four-piece Indie band Colour Tongues has a lot to celebrate. 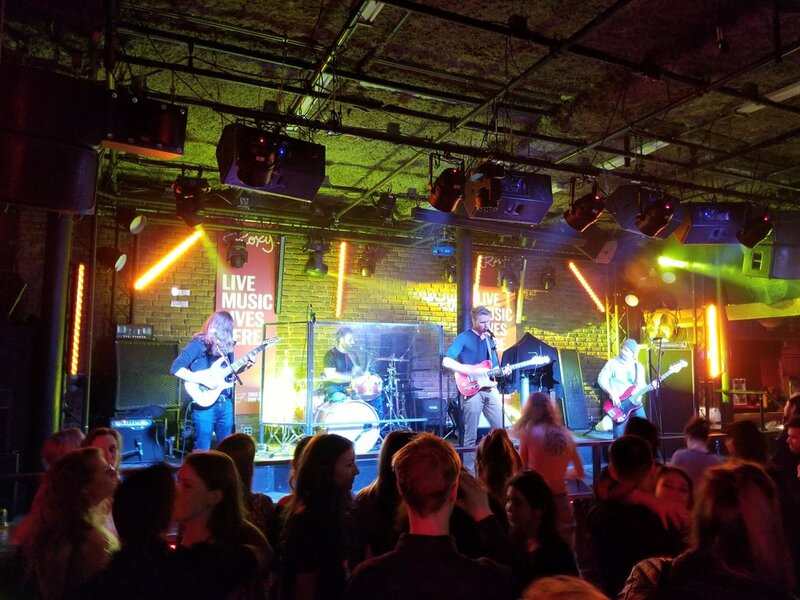 From their premier show at the Roxy Cabaret playing to a crowd of 200 people, to being listed in Daily Hive Vancouver as one of the Top 10 Concerts to see in the city, the band is excited to be hitting the road. The Sinking Ship tour will be the bands’ inaugural journey outside of Vancouver, just in time for the release of their latest single of the same name. Colour Tongues plans to bring their phenomenal rhythms and danceable vibes to new fans on both sides of the Rockies, playing seven shows in Western Canada from Mission, BC to Calgary, AB. If you're just tuning in, Colour Tongues paid a visit to our friends down at Pacific Sound Radio embedded in the front of Save on Meats in downtown Vancouver. Take a listen and hear hosts Travis and James ask us about our influences, how we came together, and how James Challis beats us with a cane at practice. We also played two never-before-heard acoustic version of two unreleased songs. See you soon at our upcoming show at the Astoria in Vancouver on April 8th. Colour Tongues is FACTOR Approved!!!! Last week kicked off to an epic start when we found out that we have been approved for FACTOR funding! For those you don't know this is a highly coveted source of funding in the Canadian music scene. We are very grateful to the THE FOUNDATION ASSISTING CANADIAN TALENT ON RECORDINGS for selecting us, and we plan to produce some incredible music with it. Thanks to everyone for the ongoing support! Colour Tongues featured in Daily Hive's Top 10 Concerts for March! Lineup is confirmed for March 16th at the Biltmore! 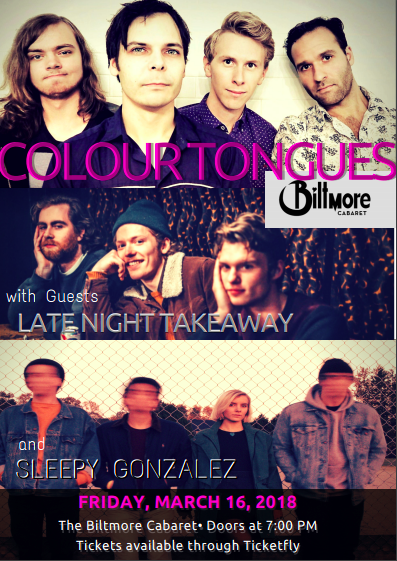 We're very excited to be sharing the stage with Late Night Takeaway and Sleepy Gonzales. These are two very talented up and comers in the Vancouver music scene. We'll be announcing the release of out latest single, Sinking Ship at the show. Don't miss it! Math rock – often held in derision by some music critics and detractors, but loved dearly by its converts. On their debut EP, Vancouver four-piece Colour Tongues navigate an earnest, pleasant technical route that methodically touches most of the bases associated with the genre. Prominent math indie bands such as Minus The Bear and This Town Needs Guns makes for clear influences across the four tracks. The instrumentation, catchy, and upbeat boasts the requisite playing ability and the song writing is consistent throughout. While the production on the EP occasionally doesn’t do the band’s tight , lush melodies full justice, the release itself is a quick, wholly enjoyable listen. What. A. Night! Thanks to the 160+ plus people who came out to celebrate the release of our new single "Temper". Great job by our openers Crystal Kelly, and of course, a special thanks to Randy on the sound board for making us all sound so damn good. We'll see you all again at the Princeton on February 24th, and then again at the Biltmore on March 16th. With a very special thanks to the team that produced it, Colour Tongues is happy to announce the release of our new single "Temper". Produced by Olivia Quan at Monarch Studios, Mixed by David Sikula at Demitone Productions, and mastered by Brock McFarlane, check it out on Spotify, iTunes, or wherever else you get your sound. We'll see you tonight at the Roxy!